Today the heart breaking news of the death of best-selling author Sir Terry Pratchett weighs heavily on my mind. Sir Terry died on Thursday 12th March, 2015, following an 8 year battle with Alzheimer’s disease; a disease I lost someone very dear to me to a few years ago. Sir Terry never shied away from talking about his condition (an ‘embuggerance’ as he termed it), and became an active and passionate campaigner for Alzheimer’s Research UK as their patron, as well as advocate for controversial topics such as assisted dying. “There isn’t one kind of dementia. There aren’t a dozen kinds. There are hundreds of thousands. Each person who lives with one of these diseases will be affected in uniquely destructive ways. There’s no clearly plotted pathway to the course of these diseases. Whilst great progress is being made towards finding a cure, what can be done in the meantime to enable those currently suffering from dementia to ‘live well’ with the condition? To this end I am so pleased that WISERD is collaborating with the IDEAL Project (‘Improving the experience of dementia and enhancing active life: living well with dementia’) – an ESRC funded 5 year longitudinal cohort study which will focus on the potential for living well with dementia from the perspective of people with dementia and their primary carers. Recent government policy has prioritised living well as a goal for people who have dementia or people who are experiencing difficulties with memory, thinking or behaviour and their primary carers (usually family members). 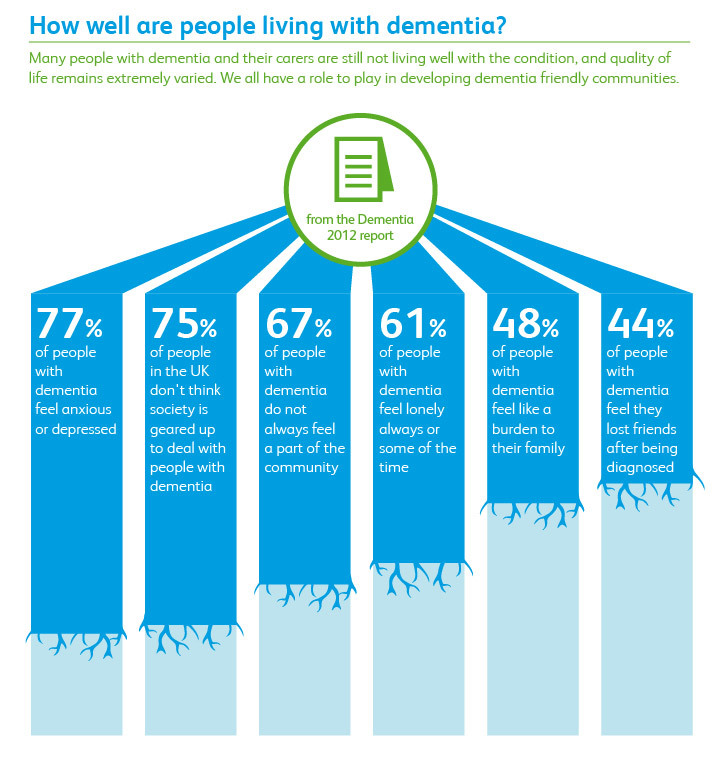 However, there is no clear definition of what it means to ‘live well’ with conditions such as dementia and no clear understanding of the factors that might influence the ability of individuals and families to live well. There has been some work on quality of life and quality of care but these measures do not capture all the elements involved in living well. Living well with chronic illness or disability has been defined as ‘the best achievable state of health that encompasses all dimensions of physical, mental and social well-being’. This project will examine how social and psychological factors influence the possibility of living well. It will identify what changes could be made at individual and community levels to make living well more possible, and will result in recommendations for social and health care purchasers, providers and planners and advice and guidance for people with dementia and those who support them. This study will be the first to create a new and detailed longitudinal data set. This data set will be a unique resource for social science research in the UK and internationally. What will the project study? This project will study various factors affecting the ability of people to live well, using the following key element: capitals, assets and resources, challenges, adaption and the ability to live well. These elements are all inter-linked. Psychological factors (such as self-esteem or optimism). 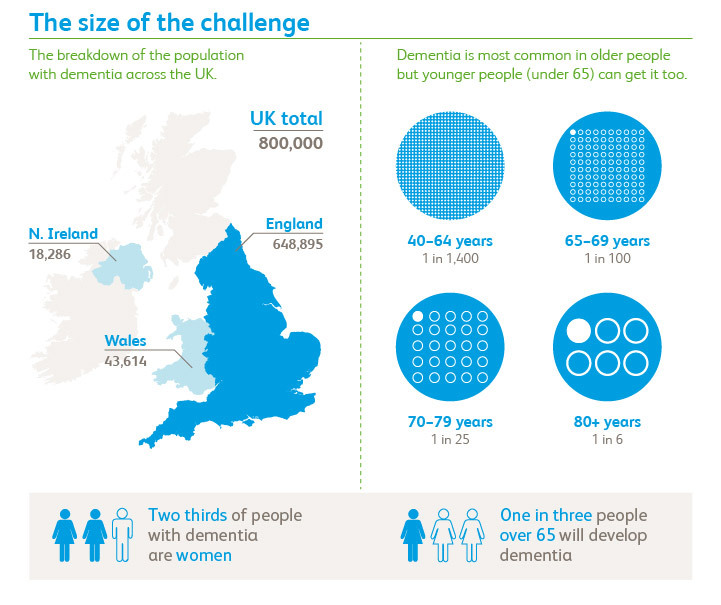 Challenges refers to the severity of dementia and the different symptoms experienced, and adaptation refers to the potential to be able to manage and cope with the challenges conditions such as dementia bring. A fundraising site has been set up is Sir Terry’s memory to raise money for the Research Institute for the Care of Older People (RICE), and has already raised over £25k. About the author: Natalie Richards is the Communications Officer at WISERD, based at Cardiff University. She is passionate about the work WISERD undertakes – especially those areas of research related to improving quality of life in later years. 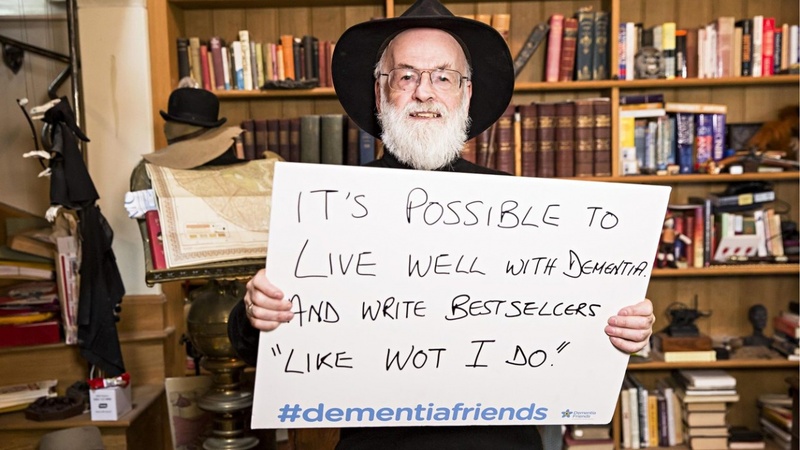 Image source: Terry Pratchett – Jeff Moore for Dementia Friends. 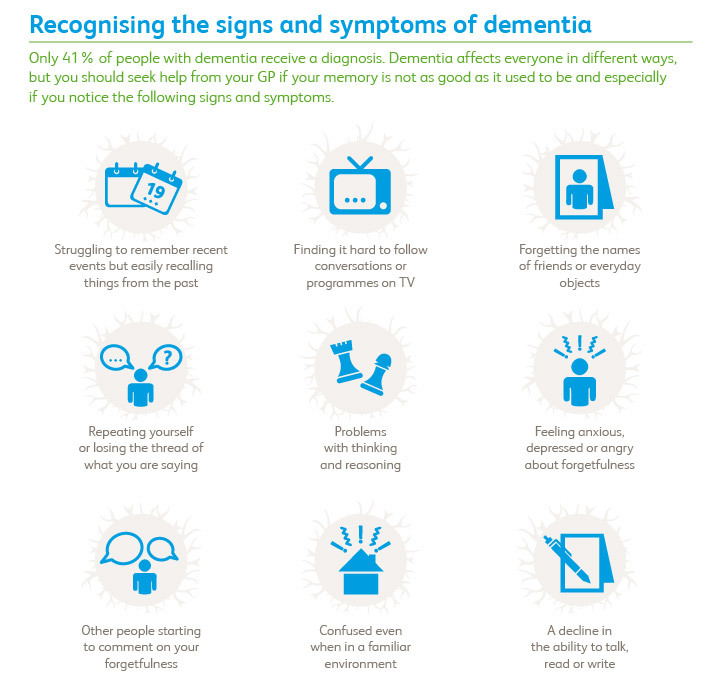 Dementia Infographics – Number 10, via Flickr.